RSS.IM allows you to read feeds through the messaging client that you use the most. 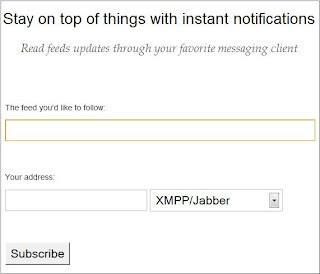 The service will push your RSS feeds as an instant message via Google Talk or a Jabber/XMPP client. Rather than setting this up for individual feeds, you can create a folder of feeds you want to follow on Google Reader and use the RSS URL of that folder, much more convenient. On the site you are provided with the option to individualize these feeds that you would like to follow one by one, and then provide the address of your IM provider. By complying with these two simple steps you will start receiving notifications in your client. You can also add a chat buddy bot@rss.im and send it an address of the feed or the website you'd like to subscribe to.